In the 19th week of pregnancy, your baby is getting longer and heavier, and you may be able to see some of those changes for yourself. Your second trimester ultrasound will be happening soon, possibly providing your first glimpse at the little miracle growing inside you. Now measuring about six inches long from the top of its head to its rump, your baby is growing fast. He or she now weighs more than half a pound. In the coming weeks, your baby will be gaining weight at a rate of two or three ounces a week. According to the Mayo Clinic, your baby is developing a waxy coating over his skin called "vernix caseosa." This white, cheese-like substance protects your little one's sensitive skin from the constant exposure to the amniotic fluid. Vernix caseosa, also called simply "vernix," may also help your baby pass smoothly through the birth canal in a few months. Over the last few weeks, your little one has slowly been developing his internal and external genitalia. Now your baby's genitalia is developed well enough that an ultrasound technician may be able to tell you whether you're having a boy or a girl. Around week 19, you may begin to notice pink or brown lines on your belly, hips, or breasts. These are stretch marks, a common pregnancy complaint, and they result from damage to your skin as it stretches to accommodate your pregnancy. WebMD recommends that you moisturize your skin three or four times daily to prevent and treat these marks, which often remain on your skin permanently if left untreated. Choose a moisturizer with shea butter or cocoa butter and be sure to rub it in well. Don't worry if you can't completely prevent the marks; over time, they will fade to white or silver and will be much harder to notice on your skin. 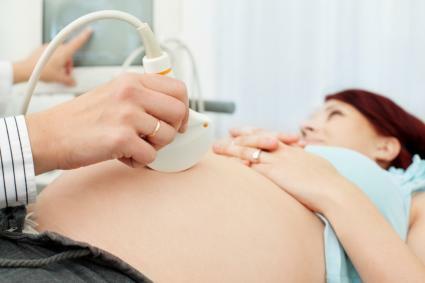 During this week or next week, your doctor or midwife may recommend an ultrasound, or sonogram, to check the progress of the baby's growth and development. You may have had an ultrasound earlier in your pregnancy as well, but if not, this will be your first glimpse at your little one. You'll get a chance to see his profile, witness that tiny heart beating, and maybe even find out whether you'll be decorating the nursery in pink or blue. Typically, an ultrasound takes around 20 minutes, according to the Mayo Clinic. The technician uses a wand, called a "transducer," and some clear conductive gel to bounce sound waves into your abdomen. The technician will move the transducer around on your belly until a picture of your baby appears. You can watch your little one on the screen. Often, you'll also get a few printed images to take home and show to friends and family. It's normal to be a little nervous about your ultrasound, but there's no cause for concern. This procedure is medically safe for both you and the baby. Your doctor may not prescribe an ultrasound if he or she doesn't feel that it's medically necessary. If you can't quite make out the image on the screen, ask the technician to explain it to you. 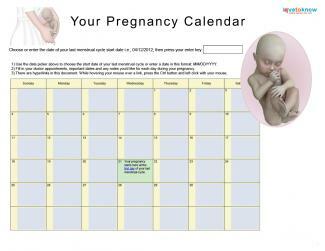 Keep attending those prenatal appointments, and be sure to ask your health provider any questions you might have. It's normal to have concerns or wonder about things, especially if this is your first pregnancy. Your doctor or midwife can investigate any worrisome symptoms and ensure your pregnancy continues to be healthy for you and your baby.